People familiar with the weather we get here in the DC area would readily understand the need for window and door awnings here in DC – and that’s where Patio Shades Retractable Awnings comes in. Based in the Washington, DC, suburb of McLean in Northern Virginia and serving the entire National Capital region including Maryland, West Virginia and the rest of the nation, Patio Shades Retractable Awnings offers a level of protection and comfort that’s difficult to find otherwise. Sometimes the weather around these parts can be downright dastardly, from blizzards to heatwaves, so it behooves the smart homeowner and businessowner to invest in protection that’s both attractive and useful to customers, guests, employees and family. Patio Shades Retractable Awnings works with all types of property owners, managers and investors. When your apartment building needs a more welcoming atmosphere, or your storefront wants to welcome more customers, or your office complex could stand to have an added touch of class, these are all good reasons to consult the Awnings Architect and Patio Designer at PatioShadesRetractableAwnings.com. That’s what we call our helpful on-line feature that helps you decide upon the particulars of your customized awning, making certain we know what you want to get, and you know what you’re going to get. With Patio Shades Retractable Awnings (accessible at www.PatioShadesAwnings.com or www.PatioShadesRetractableAwnings.com), you get it all. Welcome friends, neighbors and customers into your home, yard or business entryway, while providing them with protection from the beating sun. the pouring rain and decaying leaves. Patio Shades is the premier, preeminent, preferred awning company in DC and far beyond. We work with the world’s finest awnings materials from such time-tested manufacturers as K.E. Durasol. Then we use American expertise to hand-craft your awning’s ultimate construction at our New York facility. You’ll know that the awning you’re installing is of the highest quality available on the market while being eminently affordable, all to deliver peace of mind for you as the owner of the house or the proprietor of the business. Let’s get started. Click around PatioShadesAwnings.com, call 703-520-1983 in Washington DC / Northern Virginia, call 1-844-NU-PATIO nationwide, or e-mail [email protected] On-line, work with our Patio Designer and Awning Architect to discover the awning, pergola, window- or door-shade or temporary roof that suits your needs. 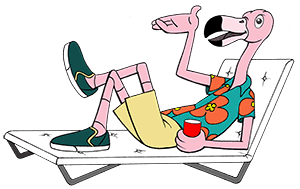 Let our friendly character Frank the Flamingo show you how to correctly obtain measurements needed for your custom awning job. Then, when your shipment arrives with your new awning purchase inside, you can install it yourself or you can reach out to us for guidance – or (in the DC area only) ask us for a connection to a local professional awning installer whose quality work we can vouch for. Order before the close of the year 2016, and you’ll not only get your shipping for free; you’ll also get 20% taken off the top of your order’s invoice. Give us a call for more details on this valuable offer. For awnings in DC, it’s Patio Shades Retractable Awnings: Hand-Crafted, Above The Rest™.